Functional and stylish, this double tray floor lamp features a brushed nickel finish and integrated USB charger on the column. An ideal addition to any living space, this brushed nickel floor lamp has two swivel glass trays incorporated to the slim profile design. The integrated USB port on the column allow you to charge a phone, tablet or mobile device easily. Double pull switches add a convenient touch to complete the look. Overall: 63" high. Tables are 24" x 28" high from floor. Base is 12" round x 1 1/2" high. Shade is 17" wide x 8" high. Uses two 75 watt or equivalent bulbs (not included); twin on-off pull chains. 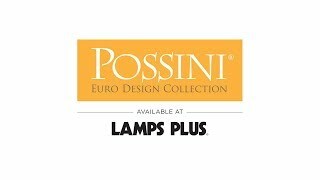 Double tray-shelf floor lamp from Possini Euro Design®. Built-in USB 2.0-A port charger on the lamp column for recharging smartphones and other devices. 2 amps. Two 12" tempered glass trays with swivel; brushed nickel finish accents. Perfect for my living room. It is modern with a classic twist. Can turn on with a wall switch and can choose lighting by either lighting up 1 or 2 bulbs at a time. 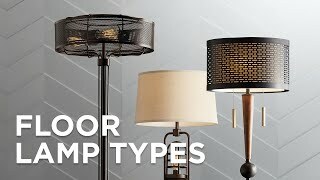 Have contemporary furniture and lamps. Needed a floor lamp for a tight space so the 2 12” tables instead of 1 18 or 24” works perfectly. Need a lamp with a table. The twin lighting feature, and two tables along with USB port. clean lines. 2 light bulbs. usb port. good as reading lamp AND good room light. Love the chain pulls; USB port, nice design. Purchased for my daughter & her boyfriend for their new apt! Simple style. Trays with USB port is a nice feature. I liked the USB connection. For the double lights and trays. Looking forward to using this in my family room. love the USB feature ! I like the height of this lamp and the USB is a bonus!! Can this light go on with a wall switch? BEST ANSWER: Yes it can. I actually have mine hooked up to a Wemo smart plug and it works just fine. BEST ANSWER: Yes - assembly is required. I have emailed you a copy of the assembly instructions for a better idea of how it arrives to you packaged. The fixture comes with wiring completed through the assembly. Do not follow instruction when screwing the sections together. Screw the pole above the glass shelving first. This will allow you to pull the wire through more easy Pull the wire through to so the top light fixture meets the pole but not screwed in. I left the fixture on the box to support and not scratch the assembly. Screw in the bottom pole into the glass shelving next screw the bottom of the fixture in and pulling the insuring you pull the wire through to the bottom. The bottom is a heavy weight. Last screw the light fixture into the top pole above the glass shelving. Install the lamps needed and put on the shade. They have some one-sided felt washer included in a bag, they are for the base to correct for un-level surfaces. Most floors are already flat and level, you will be able to tell if you need them by putting lamp in final resting place than looking to see if it is square with the room. You do not need a level to do this step. How bright will this lamp get? I live in a wooded area and my living room approx 15 x 20 ft does not get much light. Will this lamp suffice? It will depend on the lumens of the bulb you put in it. it only has one setting, on and off for each bulb. it's a standard incandescent socket. The labeling says it can handle up to a 75W bulb in each socket. I bought the recommended bulbs when I ordered my lamp and it really lights up my den of about the same size. I am pleased with this lamp and would purchase again. What is the maximum shelf height ? High quality lamp that looks expensive but wasn't. The 2 glass tables attached are great for your TV remote or drinks. This is going in our new addition which is a master bedroom suite. I love the fact that it will match the ceiling lamps in the room as well as have charging inputs for my phone and Ipad. It is sleek and modern and will fit our new space perfectly! 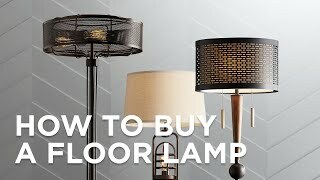 I really like the this floor lamp. Just wish it came with other color options for the shade. 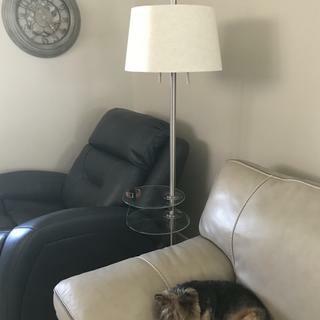 Would like a beige shade - but other than that the lamp perfectly suits my needs. Serves its purpose perfectly, but not quite balanced, despite manufacturer's inclusion of felt stickers to place strategically under the base of the lamp. We like the design, as it is less intrusive and allows us to charge a (1) phone and place a drink. Works like a charm. two I independently controlled lights, two shelves that swivel to position, and a solid, heavy base to prevent tipping...glad I bought it! 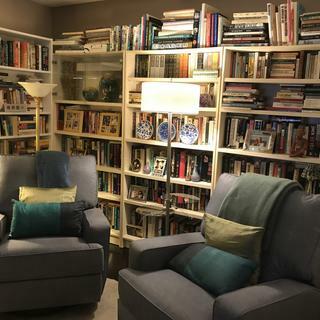 Love the lamp the swivel glass shelves. Very heavy. Great quality. 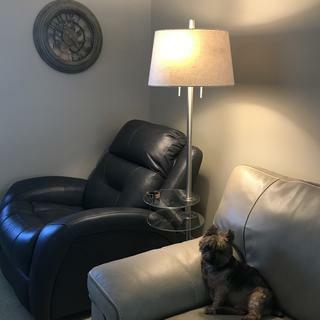 This lamp is perfect and now I don't need another end table. Love this lamp! It fits perfectly between our 2 chairs & gives us a place for our drinks! 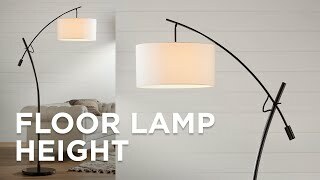 I love this lamp I have a sectional and no room for an end table. This lamp with shelves and charging port are perfect. Always excellent service from Lamps Plus. I'm confident they will continue to stand behind products. Shipped promptly as are all products I purchase from Lamps Plus. It arrived on time and in great shape! Needs to have 2 USB connectors not one. The light works very well and gives out a uniform light dispersal. 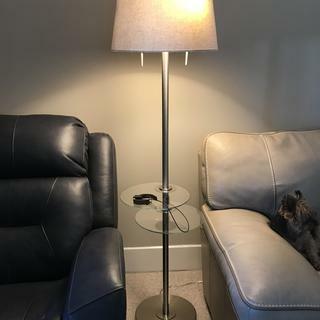 Only gave this a four star because the directions were not accurate for this lamp. I also saw this same criticism on another review. After trial and error, got it together and really like the look of the lamp. First lamp had the table top glass piece broken. Was easy to return and I was promptly sent a new lamp. Totally love it. Great lamp. Perfect arrival. With tracking, a daily update as it came across the country. This lamp is packed in so much crumbled styrofoam that I'll be cleaning up styrofoam for days, and the USB port on it doesn't work, but I'll be damned if I'm going to tear it apart and package it back up to return only to go through this with the replacement. For the price point of this, it shouldn't have been packed in loose styrofoam blocks, but wrapped styrofoam blocks. Nobody wants to clean up styrofoam pellets for days! Other than that, the lamp looks nice, and seems to be of sturdy build quality. Not so sure I'll ever buy online from Lamps Plus again, though. Hi Scott B., have you already been in touch with our customer service team to see if there is anything we can do to help? If not, please don't hesitate any longer to reach out to them directly for assistance. Thank you.